DISASTER AID APPROVED: Gov. 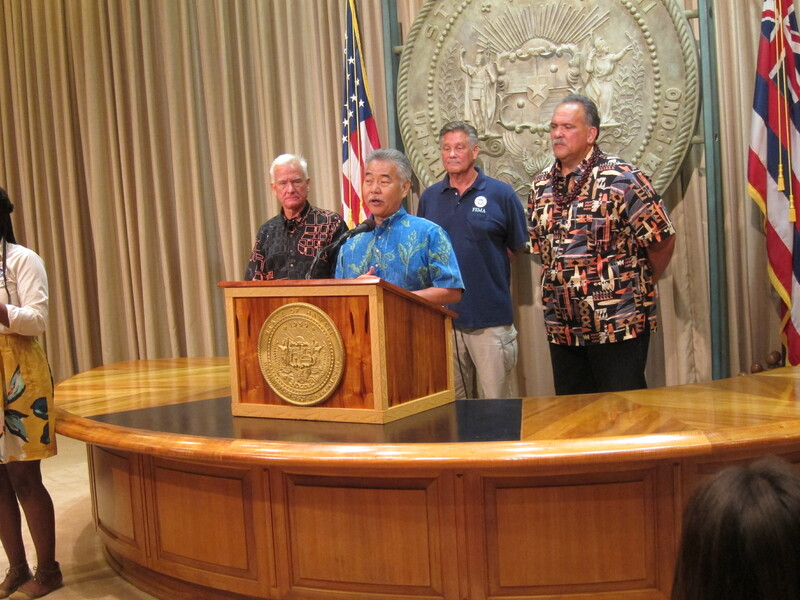 Ige, mayors Kirk Caldwell and Bernard Carvalho and FEMA’s Dolf Diemont deliver the good news for O’ahu and Kaua’i families. Persistence and determination at every level — from emergency response teams who went door-to-door to government officials who wouldn’t give up — paid off in getting federal aid to Kaua‘i and O‘ahu families hard hit by the severe floods. 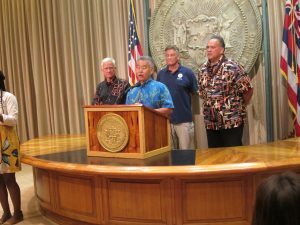 In a June 27 news conference, Governor Ige announced the president had approved the state’s appeal of a Major Disaster Declaration for individual assistance. The approval paves the way for residents affected by the floods to apply to federal programs that include disaster crisis counseling, disaster unemployment assistance, and FEMA grants for home repairs and temporary housing. Dolf Diemont, FEMA coordinating officer, praised the state’s efforts, calling it “a model of how you respond to a disaster.” For locations of Disaster Recovery Centers and other questions, go to http://dod.hawaii.gov/hiema/frequently-asked-questions-federal-assistance-and-disaster-recovery-centers/. The deadline to apply for FEMA aid is Aug. 27, 2018.